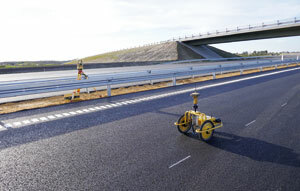 A new robotic line marking tool negates the need for surveyors to manually set out road lines on foot, saving time, dramatically improving safety and often removing the need for traffic control on live roads altogether. Tiny Surveyor is a compact robotic cart that is designed to automatically mark out roads, sports fields, car parks and other line marked surfaces using a pre-programmed design. Distributed in Australia, New Zealand and South-East Asia by Position Partners, this unique piece of equipment promises to be a great time saver for surveyors in the construction industry. “Automation is developing apace across all industries with the aim of increasing safety, saving time and reducing or eliminating human error,” says Garry MacPhail, who manages the Geospatial Division of Position Partners. “Tiny Surveyor is the first fully autonomous robot we have introduced to the industry and it is already getting a lot of interest as it is a simple piece of equipment that offers huge potential by enabling surveyors to pre-mark sites very quickly and from the safety of their car,” he adds. Although construction has seen the benefits of increased automation with earthworks and paving applications through the use of 3D machine control, line marking roads has continued to be a highly labour-intensive and manual process with each point surveyed and marked out on foot by a surveyor. In New Zealand, Christchurch-based Downer has seen a demo of the Tiny Surveyor and Senior Survey Manager Steven Hoggarty was impressed with what he saw. “It’s a survey force multiplier with excellent safety benefits,” he says. “Its speed and efficiency means it can do the work at least three times as fast as a surveyor could do it on foot, so you can get a lot more done. “I’d actually like to see them scale this product up to a full line marking system so that we could automate the process of painting on the final road markings as well,” he adds. Paul Fritz from Seymour Whyte has also seen the system and agrees that there “is huge potential for time and cost savings”. He says to realise the full benefits, some raw set-out data that could be exported from the system after it’s completed the job would help to prove the as-builts were correct, as “we surveyors have to prove that what the robot has done is per the design”. With the ability to interface with any GNSS equipment to provide positioning information, users simply upload a line design in standard CSV or DXF format to the robot via a USB key and the system is ready to work. It utilises standard spray paint cans and can work for up to eight hours on a single charge. A Topcon total station can also be used to provide millimetre accuracy and height measurements for topographic applications. For RTK GPS positioning, users can opt to use a GNSS base station or connect to an RTK network such as AllDayRTK. “To use a network an internet connection is required, so customers can either mount a field controller to the system that has internet capability, or use an internet-enabled GNSS device like the Topcon HiPer HR, which comes with a SIM card installed,” Mr. O’Toole says. The system comes with a full-function remote control so that users are always able to manually override the robot if required, but they can do so from the safety and comfort of a car that follows the Tiny Surveyor rather than having to mark each point out on foot. Position Partners has been rigorously testing the robot to ensure it is fit for purpose for Australian and New Zealand. “Customers who have seen the Tiny Surveyor in action have been impressed with its ability to follow even complex designs including curves, as well as its repeatability,” Mr. O’Toole adds.